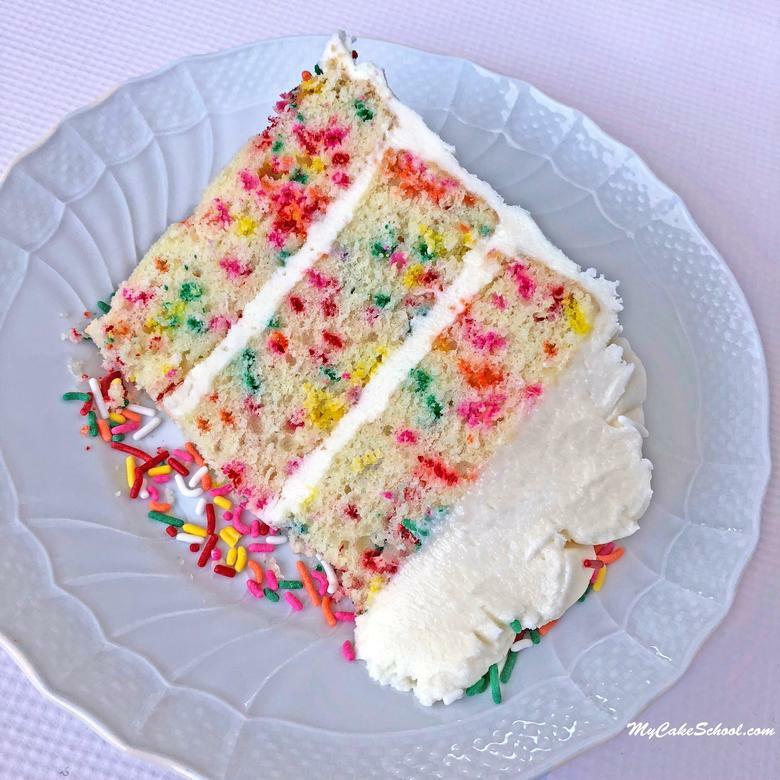 There are few recipes as cheerful as a delicious funfetti layer cake, speckled with all of the colors of the rainbow! There’s happiness in every slice. You can find funfetti cake mixes at the grocery store, but my FAVORITE funfetti cake is made from scratch! 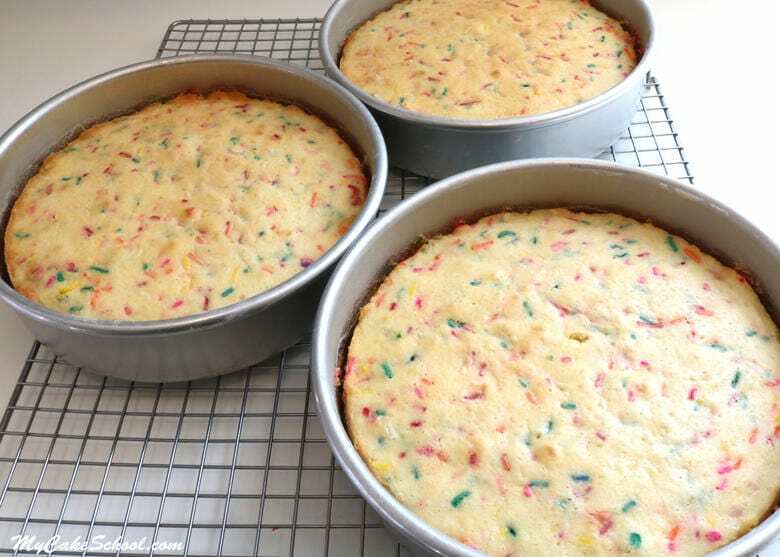 Every delicious funfetti (or confetti) cake recipe has two things in common… you need a delicious white or yellow cake recipe, and lots of colorful sprinkles. Rainbow jimmies have never let me down for this recipe (or ever, haha). They can easily be folded and distributed throughout the batter without a lot of color bleeding. Today’s funfetti cake recipe is based on our White Almond Sour Cream Cake….minus the almond. As you’ll see in our recipe, we’re using the conventional method of mixing (rather than the reverse creaming) for nice, fluffy layers. This recipe works great for cupcakes also! 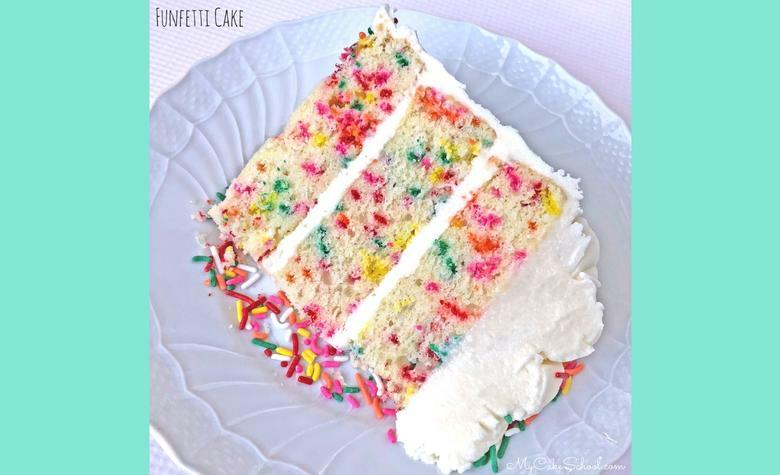 Funfetti Cakes were first introduced in the late 1980’s as a Pillsbury Cake mix. While it’s often thought of as a kids cake, I’m here to tell you that funfetti-loving kids grow into funfetti-loving adults! This cake is popular with my whole family. 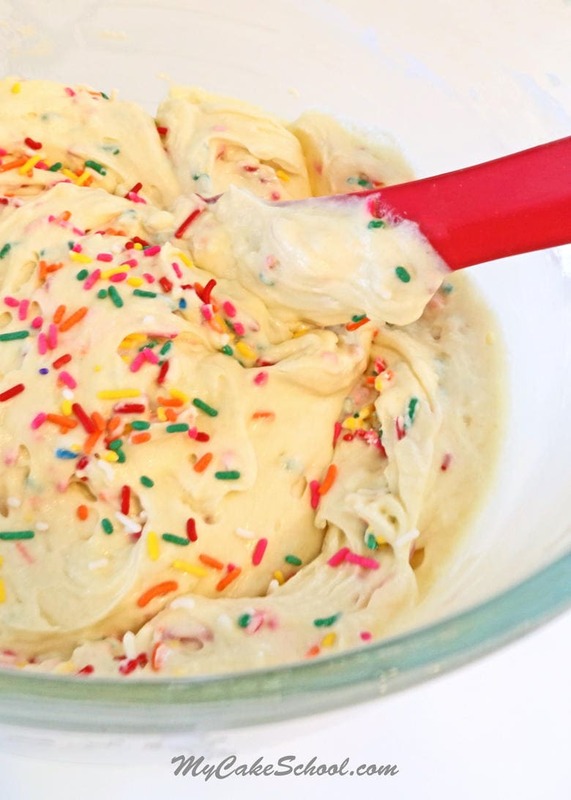 A scoop of sprinkles has a way of making any dessert more festive! 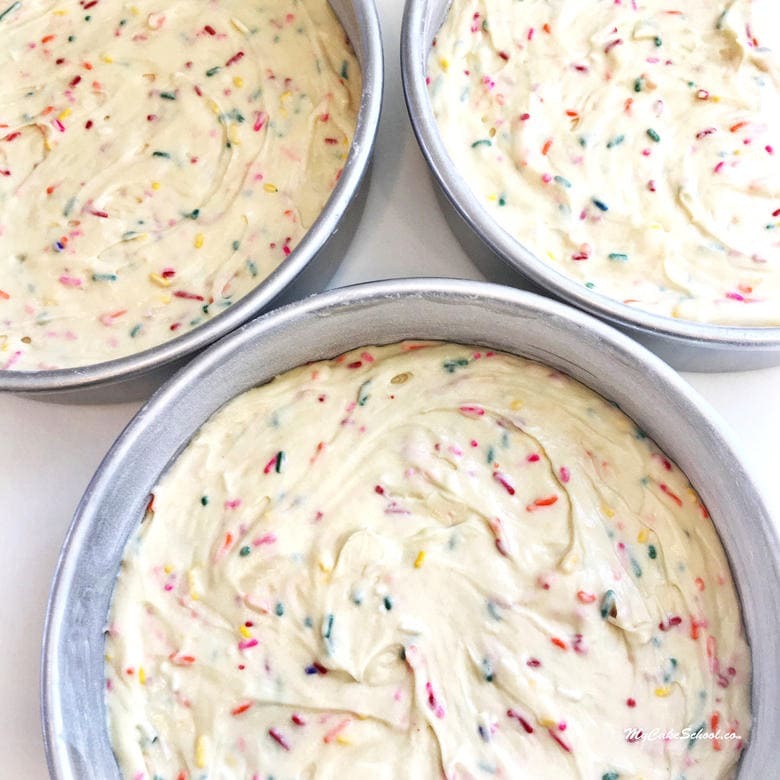 After folding our sprinkles into our cake batter, we divided the batter between three greased and floured pans (lined with parchment). I recently made a funfetti cake for our free Unicorn Cake Topper Video Tutorial from our Free Cake Video Tutorials section. 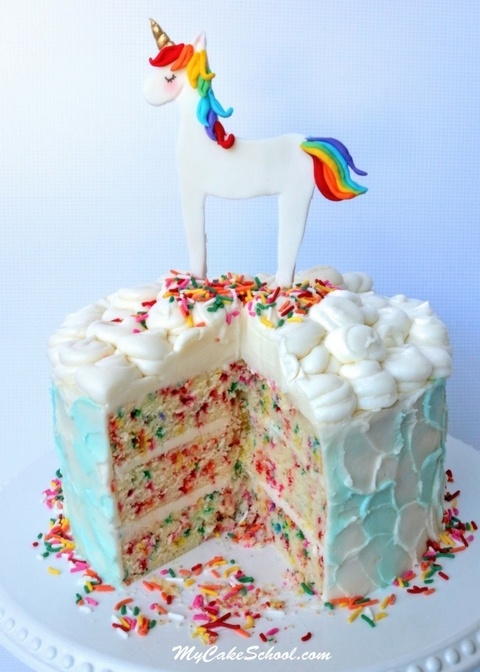 Unicorn cakes call for a little extra color! And here is a closeup of our slice in all of it’s speckled funfetti glory! Enjoy the recipe! If you give it a try, we’d love for you to write a review or leave a photo in the comments below! In the bowl of your mixer, beat the butter until softened. Add the sugar and beat 3 to 4 minutes until lightened in color and fluffy. Scrape the bottom and sides of bowl midway through. Add the eggs one at a time, beating after each one until yellow streaks disappear. Add dry ingredients alternately with wet ingredients, mixing until dry ingredients are blended in. Begin and end with dry ingredients (3 additions of dry and 2 of wet). Fold in sprinkles just until evenly distributed. Don’t miss our full collection of tried and true favorite cake and frosting recipes in our Recipes Section! There are so many wonderful recipes to try! 3. In the bowl of your mixer, beat the butter until softened. Add the sugar and beat 3 to 4 minutes until lightened in color and fluffy. Scrape the bottom and sides of bowl midway through. 4. Add the eggs one at a time, beating after each one until yellow streaks disappear. 5. Add dry ingredients alternately with wet ingredients, mixing until dry ingredients are blended in. Begin and end with dry ingredients (3 additions of dry and 2 of wet). 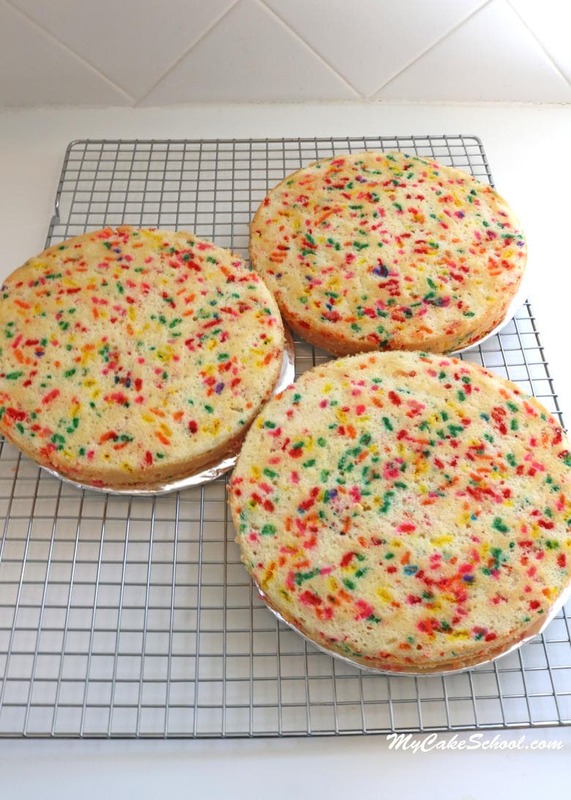 Do the sprinkles bleed when thawing if I freeze the cakes? Thanks! Hi Ellen, I am not sure about that. There could be some condensation after freezing that could give you a problem. To be on the safe side I would put the jimmies on top of the cake after it has thawed and the condensation has evaporated. Sprinkles will bleed on buttercream so be sure to use jimmies. Hi Katie, I’m sorry your question was overlooked. Yes, the recipe makes enough batter for a 9×13 pan. I am going to be making this today. I had heard coating the jummies will prevent them from sinking. The picture you showed they were very nicely through the whole cake. So is this not an issue? Also I have heard rave reviews about your doctored wasc cake. Would this work well with that cake? Hi Crystal, We did not have a problem with the jimmies sinking. Maybe if the cake batter was very thin that could be an issue, but we have not experienced it. The funfetti recipe will work well with the WASC doctored or scratch recipe. Hope you enjoy this fun cake. How could I adjust to make 3 10in pans? Maybe time and 1/3 or time and 1/2. Thanks!!!! Hi Amanda, This cake makes 7 cups of batter. You will need 6 cups batter for a 10″x 2″ pan. You will have some batter left over but you will need to triple the recipe. Bake at 350 degrees for 40-45 minutes (check at 35 min.) We usually use inverted rose nails for a 10 inch pan. If the tops begin to get too dark, cover loosely with aluminum foil. Below are to cake batter charts that you will find helpful. Hey Lovelies, I want to use this amazing recipe, but I was wondering, is sour cream a must here? It’s usually expensive where I’m from so I’d like to know if I definitely need it here, or if I can substitute it or omit it altogether. Thanks much. Hi Jessie, You can use 1 cup plain yogurt in place of the sour cream. My first choice is plain Greek yogurt, if that is not available to you plain regular yogurt will be fine. I hope you enjoy the recipe. Hi I’m making this cake today. I will be putting the batter in 3 6” pans and one loaf pan. How much time do they need to bake? Thanks! Hi Marlen, This recipes makes 7 cups batter. You will need 2 cups batter for each 6″ pan so you will not have enough batter for a loaf pan without doubling the recipe. Bake the 6 inch pans at 350 degrees for 22 to 25 minutes. When a toothpick comes out clean or with just a few crumbs attached, they are done. Ok great thanks! I will double the recipe then. What would be the baking time for the loaf pan? What would be the baking time for a loaf pan? Not sure what size pan you are using, for a 9×5 loaf pan bake at 325 – 350 for 45 to 50 minutes. You could use two 8 x 4 pan and bake for 35 – 50 minutes depending on how full you fill them. You will have some cake batter left over, maybe make a few cupcakes that you could freeze for later. Hi Sharon, Thank you for your nice comments about the site! You do not need to change anything to use this recipe for cupcakes. Bake at 350 degrees for 15 to 20 minutes. Check at 15 minutes. Depending on how much batter used for your cupcakes, I think you should get at least 30 cupcakes, fill the cupcake liners about 2/3’s full.